Langhorne man launches new board game focused on keeping kids active - Times Publishing Newspapers, Inc.
Jarryd Goldberg, of Langhorne, spent five years after college as a professional soccer player and has since worked in the toy industry. His new profession is what motivated him to create a board game of his own, inspired by his fitness-focused family and wanting to see his two children stay active as they grow. Introducing “The Floor is Lava!” to the community has been a huge success. In Jarryd’s board game invention, colored foam tiles work as the rocks to help players jump from one to the next, mixing together ideas from Twister and a Musical Chairs element. You have someone who is the spinner, who spins on a Twister-like board. Each kid has to move to a certain color based on what is spun, and whoever is last to get to the certain color takes away the tile they were last on. Jarryd was pleased to learn that, as the game has been on the market for almost a year, one of the coolest responses he has had is that people are incorporating their own creative rules into the game. The game not only sparks interest in those who buy it, but it has since started to be noticed by award companies, and recently won two awards – one from the National Parenting Product Awards, which is one of the top family game awards, and one from Tillywig Toy Awards for Best Family Fun. Jarryd licensed the game to Endless Games, who has been in the toy industry for 20 years and specializes in family entertainment. 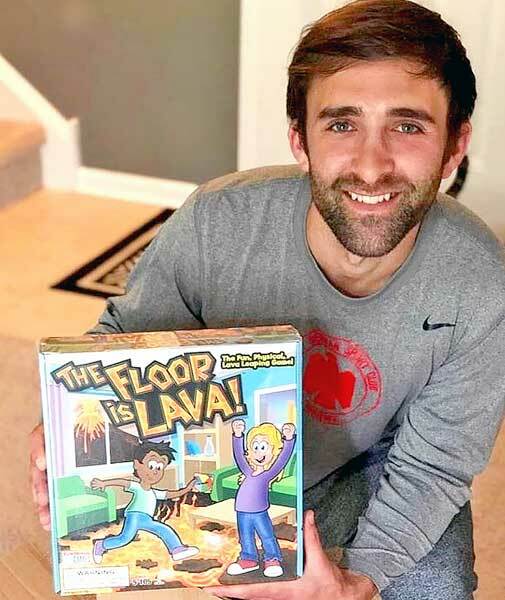 Endless Games helped to market “The Floor is Lava!” to mom and pop shops throughout the community, and as sales grew, other major retailers started to take notice, such as Target and A.C. Moore. The best part of creating his own family game? The creating isn’t done for Jarryd – he has much more in the works and has big plans for the near future. The next game he’s releasing is a twist on Frogger called “Traffic Cop,” which will be released at the New York Toy Fair this year. As Jarryd explains it, there will be a ‘traffic cop’ or one kid on one side of the room (or “street”) and all the other kids on the other side. Along the crosswalk map are activity cards so that the kids continue moving and staying active as they play. To purchase “The Floor is Lava!” or learn more, check out the Endless Games website at www.endlessgames.com/product/the-floor-is-lava/. Get your kids up and moving with an innovative take on an old beloved game and see what all the buzz is about!